The poor Irish, it seems like they can never get a break, which is perhaps what makes them so interesting to everyone else. There are some great films that are about the Irish: The Informer (1935), The Quiet Man (1952), Barry Lyndon (1975), and yet few document the real Ireland. Instead it is an idealized or distant historical Ireland that we see, although more modern films like The Field (1990) or The Replacements (2000) suggest that things may be changing. Rocky Road to Dublin is a the missing really great Irish documentary, but true to Irish form, it never got the recognition it deserved when it was released in 1967. I’d like to think that it will do better this time around. Director Peter Lennon is an Irishman who’d been living in Paris and working as a journalist. In the early 1960’s he heard rumors that Ireland was beginning to culturally thaw and he went to see if it was true. His writing drew fire from the Irish establishment but also gave him enough credibility to enlist French cinematographer Raoul Coutard to return and shoot a documentary of life in Ireland. This was to be Lennon’s first film. Rocky Road was shot while Coutard was working with Truffaut (The Bride Wore Black) and Godard (Week End) and his skilled eye makes Rocky Road much better than I would have expected. It has the look and feel of French New Wave but is totally Irish with Lennon’s direction. I think there are three main elements to Rocky Road: Lennon’s text, Coutard’s eye, and Ireland itself. Together they make for a film that I thoroughly enjoyed. Made before the 1960s social deluge (and before “the Troubles” in Northern Ireland), it shows a closed and socially conservative Ireland that would have been the norm 50 years earlier anywhere else. It is 30 years after the revolutionary separation from the English but now it’s the old guard Irish revolutionaries and the Roman Catholic Church that are keeping the Irish down. Rocky Road was shot in 1966 and released in 1967 but could not get shown in Ireland because of its politically incorrect views of the government and the Church. One of those views was that by 1966, the Church was a shadow government of Ireland. This would make it an interesting case study for our own cultural conservatives who wish for a theocracy. It also makes me wonder if the same kind of film could be made in Poland today... perhaps a Rocky Road to Warsaw? The film begins with a scene that might have been shot in Mao’s China. Boys in the same Church-run school that Lennon attended (indeed in the same class room) stand stiffly and recite their catechism like old time teletype machines. They rattle off words that they may or may not understand and then look off camera to see if they did it right. It’s an exercise in memorization not an education. Or rather it’s an education but perhaps not on the one that was intended. We get a brief Irish history lesson and then we visit a crowded pub where everyone is stereotypically engaged in the twin Irish pastimes of drinking and singing. Lennon contrasts that with a socially correct ballroom where boys and girls meet in an approved manner (the schools being segregated) and Lennon then shows us a “modern” club where things are a lot more out of control. The kids are dancing to rock and roll and it looks less Irish and more like the rest of the world. There are storm clouds of change on the horizon. But these are working class kids and not the established and conservative Anglo-Irish who seem to have done well since the revolution and are happy with things the way they are. They will accept change, but only on their terms. We see an earnest young priest who is trying to pass as a hipster and fooling no one except perhaps himself. An Irish censor talks about how Ireland is degenerating. He says he doesn’t like the change and yet with Irish fatalism wishes the brave new world well. Censorship is a main theme in Rocky Road and Lennon says that one of Ireland’s most notorious exports has been its writers who cannot get published at home. In what might be the film’s cinematic low point, a list of expat writers and playwrights scrolls up the screen to the tolling of bells. This is clearly an emotional subject for Lennon and shows that sincerity does not necessarily translate to art. But that is only a hiccup and we are treated to a sweet interview with John Houston who was filming in Ireland at the time. Lennon makes the point that Houston was an Irishman who had returned to Ireland. Perhaps film could be the thing to save Ireland? In 1968 Lennon submitted Rocky Road to Cannes and it had the distinction of being the last film shown before the festival was shut down in sympathy with the Parisian student strike. Talk about bad luck. I think Rocky Road never caught on because it is about what happens after a revolution has ossified but came out when everyone else was just starting their revolutions. For instance I did not know that it was illegal for Irish athletes to compete in or even watch “foreign” sports like soccer, cricket, and rugby — “foreign” being a code word for “English.” That’s not exactly 1984 but it’s still prissy and invasive. Who wants all that bad news about the revolution when you’re out on the street throwing rocks at the cops? In the ’60s there was a certainty that the kids were going to save the world and that hope is wonderfully illustrated in the closing shots of Rocky Road when we see children running down a street chasing after the camera. This scene is in part an echo of the early factory gate films, part home movie and part pure filmmaking. It is the perfect antidote to what would otherwise be a pretty dark film. And maybe this hopeful enthusiasm is also the most Irish part of the film as well. 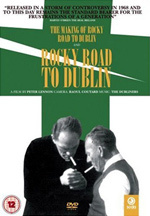 Along with Rocky Road is the 2004 documentary The Making of Rocky Road to Dublin. Lennon reunites with Coutard who explains that he had no qualms of working with Lennon even though Lennon had never made a film before, because it was going to be a fresh experience. And we find out that the “hip” priest in Rocky Road and who defends celibacy, had a mistress while Rocky Road was being made. Lennon recalls the 1968 Paris student strike and we see an archival clip of him pleading with Truffaut to continue showing the films. Credit is also given to the Irish Film Institute for restoring Rocky Road, so it looks like things have changed in Ireland. What I’d like to see now is the documentary that fills the gap between 1966 and 2004. For being a restored film, this DVD does have some unintended grain. Perhaps this is the best that the IFI could do with what they had to work with. And maybe I’m getting spoiled as I’ve seen some amazing restorations recently. But the blemishes are flyspecks and the overall image quality is very good. The sound is a bit muddy and the theme song was unintelligible to me in part because of the Irish brogue and in part because of the speed at which the song is sung. A copy of the lyrics would have been nice. All in all these are quibbling complaints. You might want to brush up on your Irish history, particularly the first half of the 20th century.